Go ahead, collect your rainwater. Everybody’s doing it. While Hari Krishna was visiting his native India recently, he traveled through a remote rural village and saw that rainwater was being collected from the roofs of some of the buildings. He stopped and asked the villagers how they learned to build the catchment system. One man went inside and promptly brought out a copy of The Texas Manual on Rainwater Harvesting written by none other than Krishna. A longtime employee of the Texas Water Development Board, now working as a consultant, Krishna was gratified to find his handbook so far from home, but not all that surprised. But why did all this happen in Texas and not, say, Arizona, where it is generally drier; or California, where, by reputation at least, early adoption of alternative technology is common? But when you look beyond the economics, you find that people build rainwater systems for a variety of reasons both practical and, perhaps just as importantly, philosophical. Those reasons are often interconnected. Rainwater collection systems are about as individual as their owners, and the various configurations cover a wide range of situations. “We wanted as light a footprint on the land as possible. We wanted to be as green as possible,” said Rick Ertel. They succeeded. The house has been awarded the Leadership in Energy and Environmental Design (LEED) and Greenbuilder platinum awards, their highest certifications. It uses many natural and recycled materials such as cedar posts for support, natural clay plaster on the walls and countertops made from recycled glass. The Ertel house is not only beautiful; it is also a powerful statement of what individual homeowners can do to live sustainably. But it didn’t come cheap. And the rainwater collection system was a substantial part of that cost. Such homes could safely be called high-end, but fortunately rainwater collection, whether installed by a professional or by a homeowner, can pretty much cover the spectrum of economic situations. It’s especially reasonable if you build it yourself. Around half of all rainwater systems in homes are partially or completely owner-built, according to Billy Kniffen, an AgriLife Extension water resource specialist. In fact, rainwater systems seem to bring out the do-it-yourself instincts in homeowners. For example, Wally Dechert of Dripping Springs not only built his rainwater collection system, he built the entire house. Like Ertel, he didn’t bother with a well, but for a different reason. The groundwater in his area is unreliable and so loaded with minerals it can eventually clog the pipes. Rainwater collection for Dechert was less expensive than a well and the water of much higher quality. He estimates his total cost for rainwater collection at about $8,500, which included a 30,000-gallon tank. His 3,800-square-foot roof will collect about 2,500 gallons from one inch of rain. “It has worked well for five and a half years,” said Dechert, “and the water is a whole lot better.” During that time, Dechert has run out of water a few times and had small quantities trucked in. 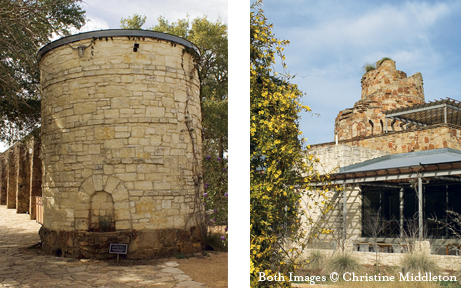 The Lady Bird Johnson Wildflower Center in Austin, a pioneer of rainwater harvesting in Texas, can also empty its tanks when demand is high. The center then resorts to city water. If you are thinking about putting in a rainwater collection system, one of the first decisions you will make is whether or not the water will be used for human consumption. If you aren’t going to drink it, your system will be simpler and significantly less expensive. But most homeowners want rainwater for household use because it is much easier on appliances and tastes so much better. To do this you must make sure the storage tank is made from non-toxic material and then decide how to filter and purify the water. At this point the choices begin to get complicated and increasingly more expensive. A specialized ultraviolet light that kills all pathogens can cost as much as $1,500, for example. 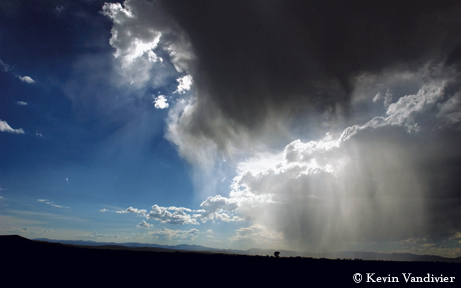 With some exceptions, such as proximity to crop dusting, rainwater itself is almost pure. Most impurities come from the collecting surface, such as roofs. Aside from bird droppings, dirt and leaves, a composite roof poses the risk that chemicals in the shingles can leech into the water, especially if the roof is hot. The Texas Manual on Rainwater Harvesting recommends against consuming any water collected from a composite shingle roof. Metal or slate is preferred as long as the sealants used don’t pose a separate risk of chemical contamination. Some experts, however, say it is fine to drink water from a composite roof as long as it is properly filtered, especially with activated carbon. The filters have to be diligently maintained and replaced on a regular schedule. And then there are some rainwater collectors who filter out only leaves and similar debris and then let the water settle. The rapidly increasing popularity of rainwater capture has, ironically, led to increasing controversy about its use. For individual rainwater harvesters not connected to a public water supply, it’s a matter of personal choice. But for those who are, it’s a different story. Much to the consternation of many installers and some rainwater collection advocates, the Texas Legislature decided in 2007 that if your house is connected to a public water supply you are prohibited from using rainwater indoors. The fear is that rainwater could potentially contaminate the public water. Increasingly, the state of Texas and smaller government entities are having a say in the rainwater harvesting world. Mostly they want to encourage it, but there are some notable exceptions. In 2001 the Texas Legislature passed laws eliminating sales tax on rainwater collection equipment. Later it passed other laws preventing homeowners’ associations from prohibiting rainwater collection equipment and tanks. Texas also encouraged rainwater collection on new state buildings and for school districts, and established a committee to create rainwater standards for indoor use with municipal water systems. Counties and some cities have incentive plans, Austin especially. The City of Austin offers as much as a $40,000 rebate for commercial installations. Other government entities are not always so rainwater friendly, however. One example is the City of Bandera, which, as of this writing, is threatening to fine a rainwater harvesting business owner $200 a day for not hooking up to the city water supply. As another example, the City of Dallas decided to classify all rainwater as storm water and requires a licensed plumber to install rainwater equipment, even a rain barrel under a downspout. Rainwater harvesting is riding a wave of renewed enthusiasm well beyond Texas. Many states and cities have new programs and laws encouraging or regulating rainwater collection. Ohio has the most extensive set of rainwater harvest laws in the country, with very specific codes for such things as materials, pipe size and overflow valves. Texas does not regulate home consumption of rainwater, but only when it is used in a public water supply. Washington state encourages rainwater collection through incentive programs, as do many cities, such as Portland, Oregon, and Santa Fe, New Mexico. Tucson, Arizona, got national media attention when it mandated that 50 percent of all irrigation water come from rainwater collection. The law was fiercely debated because many thought the percentage too low. Both the Texas Water Development Board (www.twdb.state.tx.us/iwt/Rainwater.asp) and Texas Commission on Environmental Quality (www.tceq.state.tx.us) have published extensive information on rainwater harvesting. Other resources are the Texas Rainwater Catchment Association (www.texrca.org) and the American Rainwater Catchment Systems Association (www.arcsa.org).